We purchased the one-way bus ticket plus the entrance to Nami Island for 15,000 Won (7500 Won-bus; 8000 Won-Entry ticket + Ferry). We didn’t want to take the bus going back to Insadong because we were still planning to go to Petit France and the bus leaves Gapyeong Wharf at 4:00 pm. Of course we only used this bus going to Petite France from Nami Island, then Petite France to Gapyeong Bus Terminal. It is important to note the timing because the bus only pass by each stop once every hour. Brochures are available at any tourist information centers within Gapyeong, and there you can find the bus timing schedule. Pay to the bus driver the fee and keep the ticket as it is your pass to ride this bus within the day. 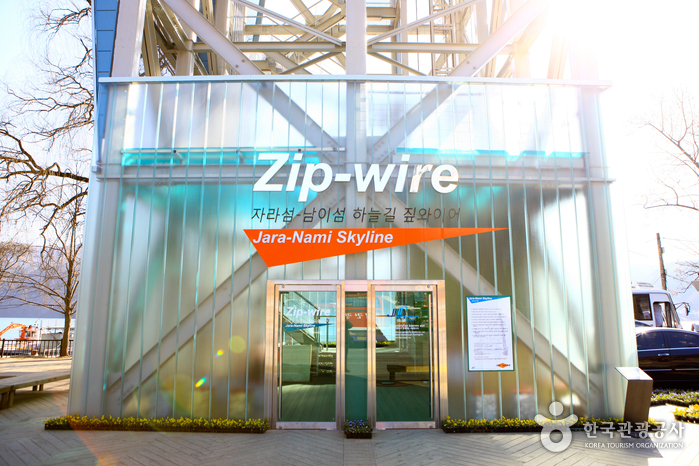 If you are feeling a bit adventurous, instead of taking the ferry, why not take the Namiseom Zip Wire? It’s not so bad since you will be in a sitting position, there is less queue and you will get to the Island in less than 2 minutes. The fee is 38,000 Won, more expensive compared to taking the ferry but I would definitely try this on my next visit. 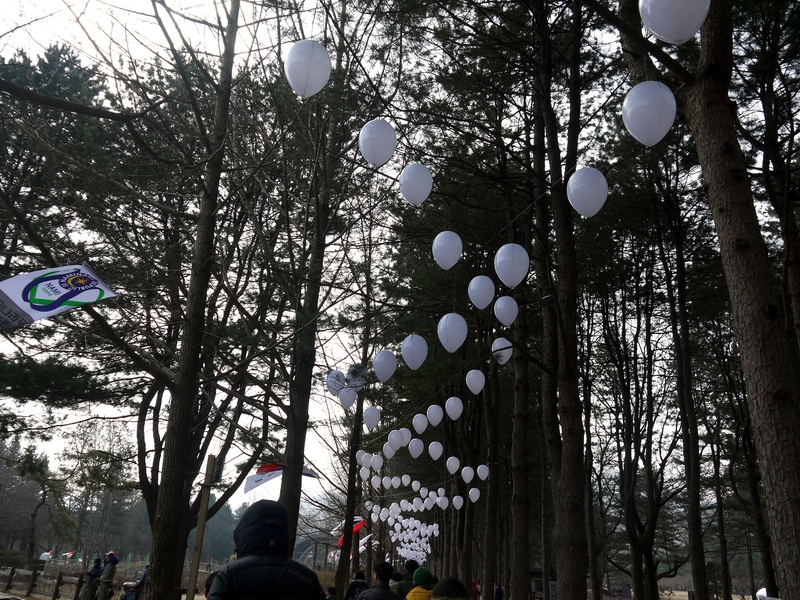 Nami Island is yet another tourist destination in Korea and no trip to Seoul will be complete without visiting this place. 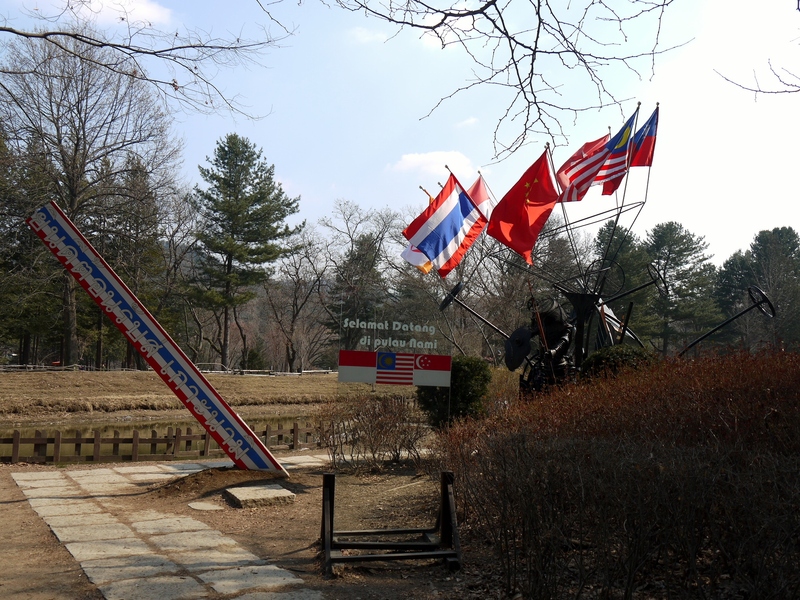 NamiIsland, Namiseom or Naminara Republic declared its cultural independence in 2006. It has its own national flag, anthem, passport, postage stamps, telephone cards, written characters, papers, and currency. The entrance fee of 8,000 Won includes the ‘Visa’ to enter to NamiIsland. They aim to preserve the natural setting which is why you won’t see any cables around the area, all are underground. But more importantly, this island was popularized by the Korean drama “Winter Sonata” which stars really famous Korean actors and actresses. 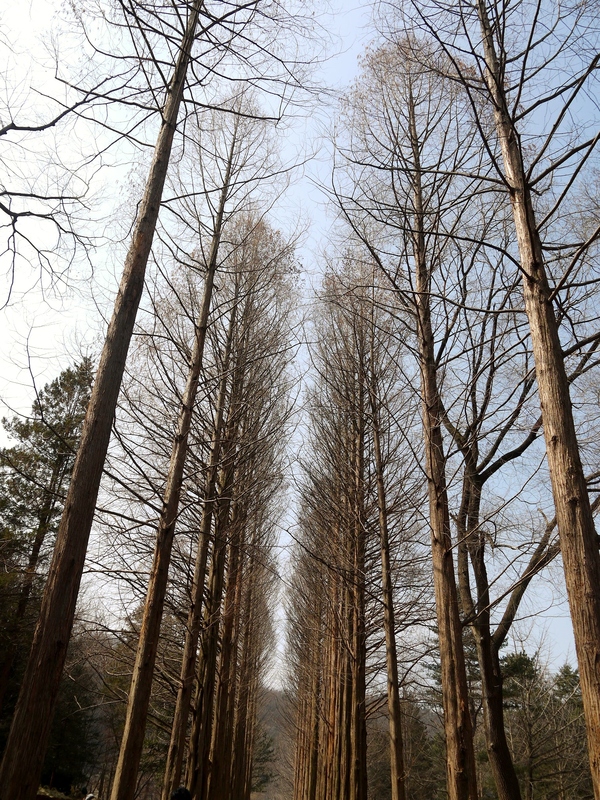 The tree lined paths are a sight for the eyes, and this place would be beautiful at any given season. I swear to return to this place in either Spring (cherry blossoms!) or Autumn, heck I bet it will look beautiful in Summer too! 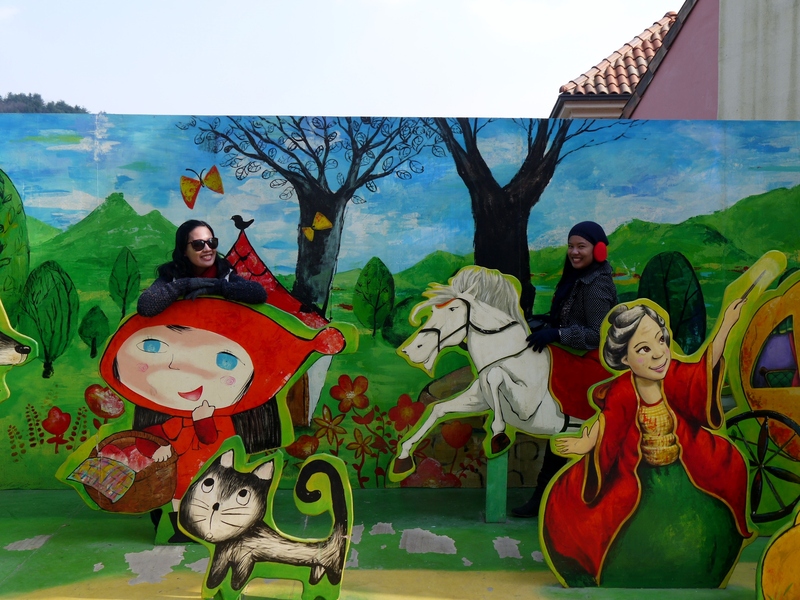 After another ferry ride back to Gapyeong Wharf, we made our way to the Gapyeong Tourist Shuttle bus terminal beside the 711 store and boarded the bus to Petite France. It took around 20-30 minutes drive, and the bus didn’t stop along the way since all the passengers seemed to be heading in the same location. Petite France is another tourist destination made famous by Korean dramas such as the one I’ve mentioned in my previous post. Another name for this place is Little Prince Village which contains a memorial hall for Saint-Exupery, the author of the celebrated French novel, Le Petit Prince. There are public performances and indoor puppet shows, although we weren’t able to see any. The entrance fee is 8,000 Won and you can get a discount by printing the coupon found in this link. After roaming around we decided to leave the village, 1 or 2 hours is enough to explore the village. We took the shuttle bus to Gapyeong Terminal and took the subway from the Gapyeong Station back to our hostel. 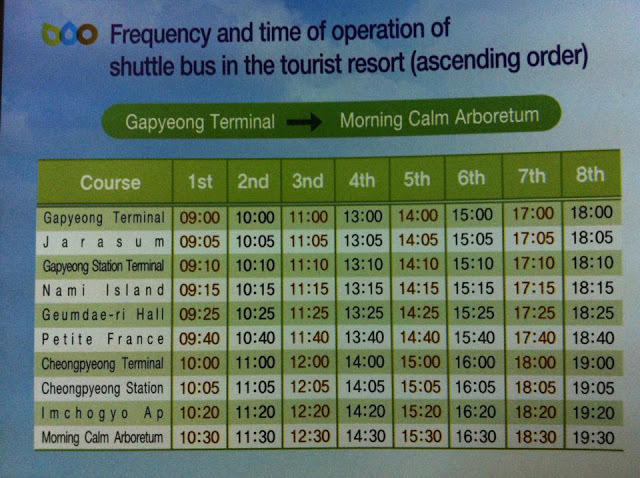 For those asking, below is the schedule of the Gapyeong Tour Bus. 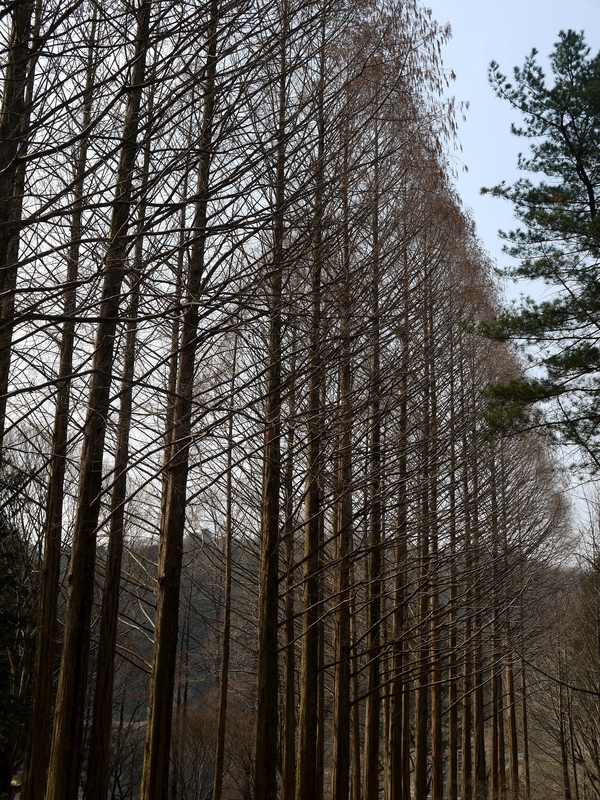 What time did you leave Nami Island for Petite France and what bus schedule were you on? 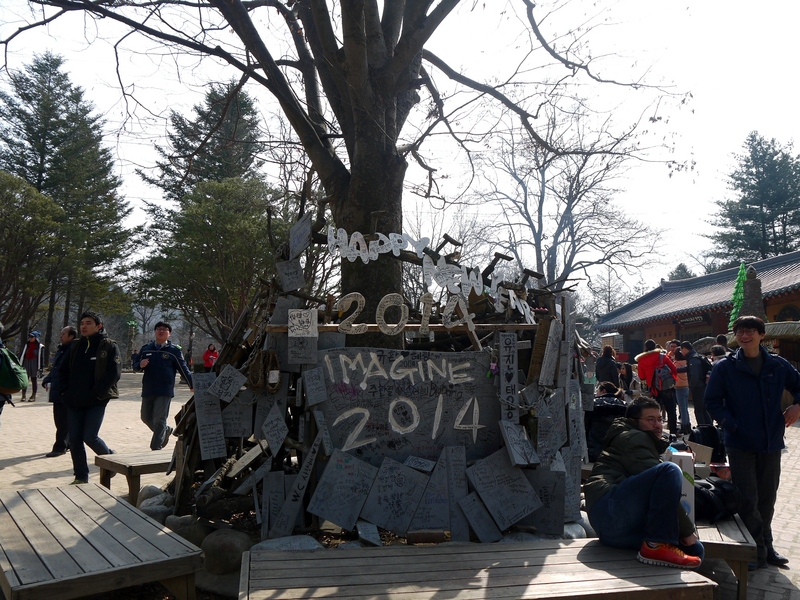 I think we took the 4th (1:15 pm) or 5th (2:15 pm) schedule from Nami Island. I have updated my entry to include the Tour Bus Schedule for reference. Hi, your travel account is very useful! thanks! 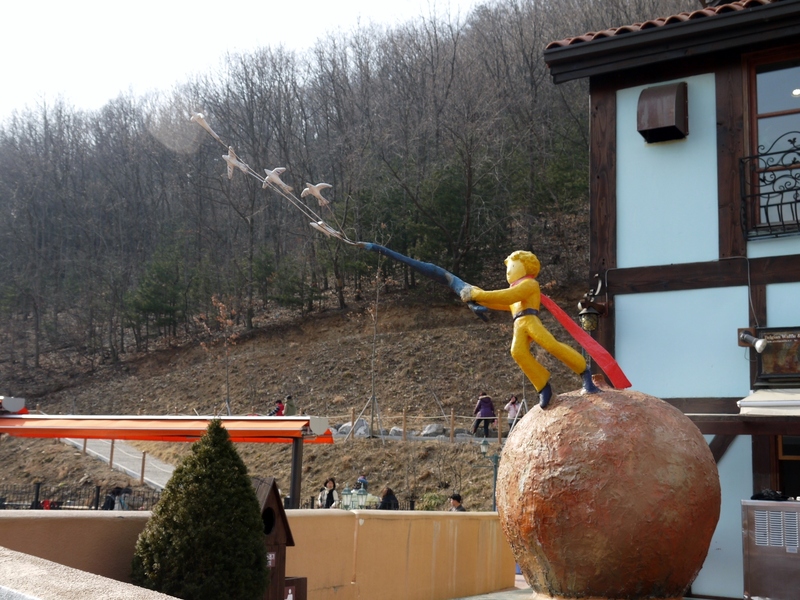 by the way, the dock to take the ferry to nami island is the same place where the zip wire is, am i right? Hi bibian! Thanks for that compliment. And yes the ferry dock and the zip wire is just right next to each other. You definitely won’t miss the zip wire. Hope you have a great time in Korea! You’ve mentioned, “Make your way to Cheongpyeong Station of the Gyeongchun Line. Exit through exit 2″… it is Cheongpyeong Station and not Gapyeong Station? You’ve mentioned your return trip “took the shuttle bus to Gapyeong Terminal and took the subway from the Gapyeong Station” … is it Gapyeong Terminal stop or Gapyeong Station Terminal stop? I mentioned Cheongpyeong station instead of Gapyeong because coming from Seoul, Cheongpyeong Station comes first. 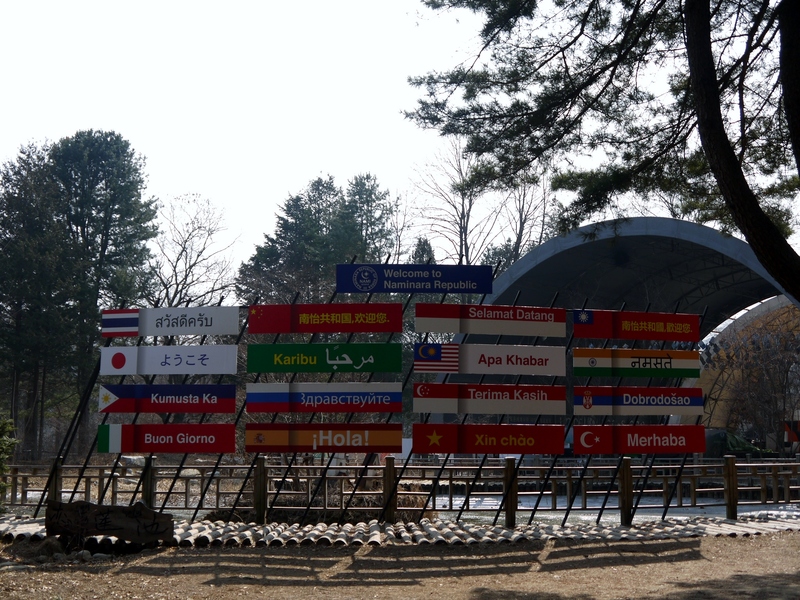 and it’s also part of the stops for the Gapyeong tour bus (from the last 2 photos in this post you can see Cheongpyong Stn as part of the stops). For this option, Petit France would be the first stop, then Nami. 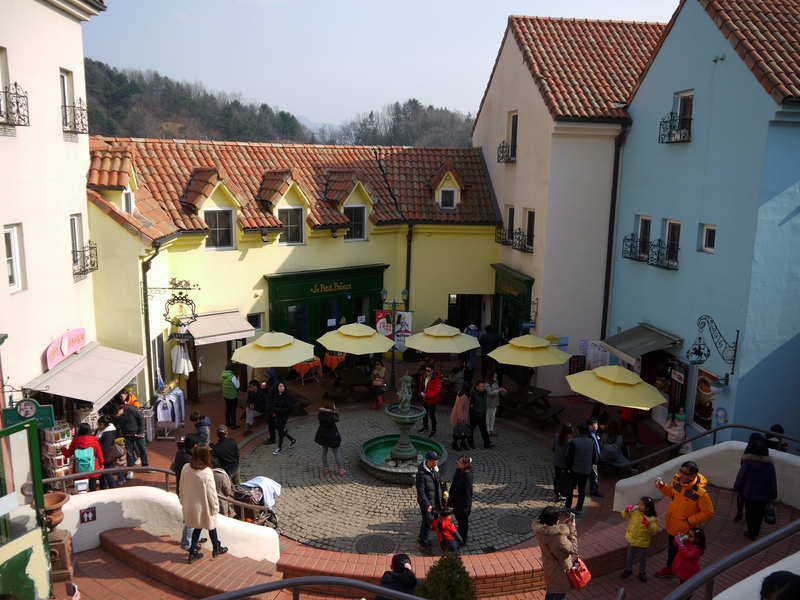 However, you can still take the tour bus from Gapyeong if you prefer. We didn’t actually try this because the bus we took from Insadong went straight to Nami Island. 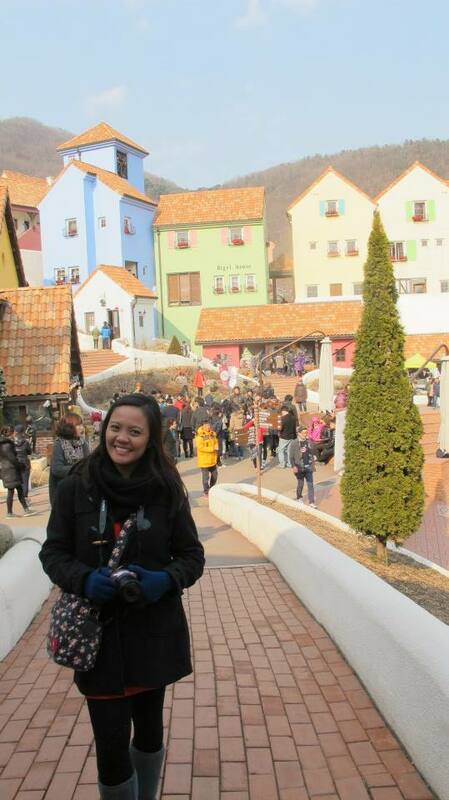 Going back time, from Petit France, the last stop would be Gapyeong, that’s why we took the MRT from there. can u explain it more detail regarding took the shuttle bus to Gapyeong Terminal and took the subway from the Gapyeong Station” … is it Gapyeong Terminal stop or Gapyeong Station Terminal stop? coz i need stop at Gapyeong Station Terminal. how to get at there? what do u mean MRT? is it used T-MONEY or buy other ticket to get off to Gapyeong Station Terminal stop. 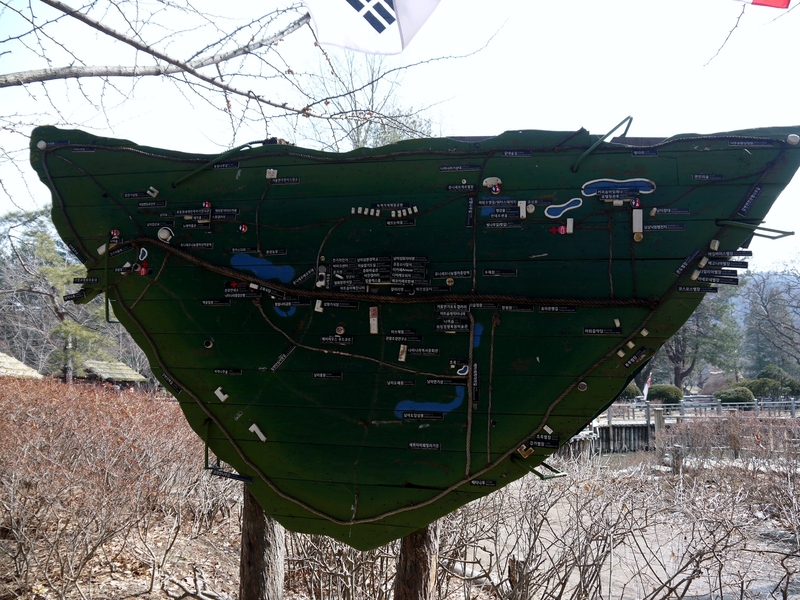 if i took taxi to nami island and can i used shuttle bus to visit petite France from nami island & how much the fee. For your 1st question, where would you be coming from? coz if you are taking the tourist shuttle bus back to Gapyeong, the last stop would be the Gapyeong MRT Station (you can see it, and also most of the passengers would be alighting by then). 2nd: You can use T-Money for subways/MRT. BUT if you are going to take the Tourist Shuttle Bus, you need to PURCHASE THE TICKET FROM THE BUS DRIVER (it was 5000 won during my time there). THIS TICKET CAN BE USED FOR THE WHOLE DAY UNLIMITED RIDE IN THE TOURIST SHUTTLE BUS, just keep the ticket because you need to show it to the driver everytime you ride the bus. 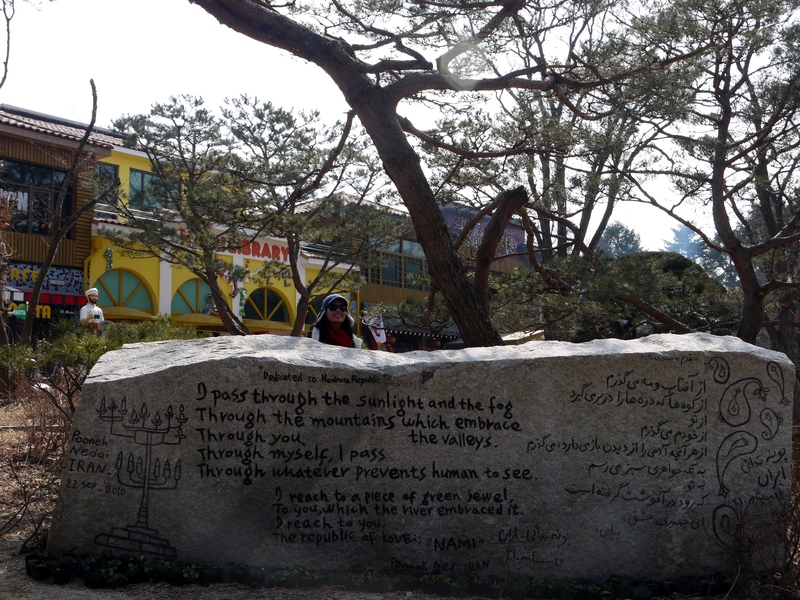 3rd: YES you can use the tourist shuttle bus to go to Petit France from Nami Island. THE PRICE is answered in number 2. Thanks. “After another ferry ride back to Gapyeong Wharf, we made our way to the Gapyeong Tourist Shuttle bus terminal beside the 711 store”. Once we reached the wharf we walked to the direction of the tourist info station (turn right). A few more meters ahead and you can see the small 711 store. There are 2 bus stops (opposite each other), one going to petite france and the other going back to gapyeong bus terminal. If your direction is to petite france wait on the 711 side. You can also ask the bus driver first if you’re unsure (do this while paying for the bus fare). Hi, will be visiting Seoul with my husband end of the year. Thanks for this post! It’s so helpful! However, i just want to confirm if the fare for the gapyeong tour bus ticket applies to either direction, that is the schedules in green and red? Say i came from cheongpyeong station going to petite france, can i ride the gapyeong bus going back to cheongpyeong station from petite france using the same bus ticket? Thanks for the compliment. Yes you should use the same bus ticket whenever you board the tour bus. You must be careful not to lose it so that u can show it to the driver anytime you board the bus. Does the bus take the same route from Garden of the Morning Calm to Gapyeong Terminal, and does it stop at every tourist spot going back? Like if I wanna start with the Garden first from Gapyeong and then do the tour “backwards”. Yes the bus stops are the same going to and fro Garden of morning calm. I don’t think it stops at every stop if no passenger wants to alight and if there are no passengers on the bus stop who wants to board. The time we went back to Gapyeong from Petit France we went all the way straight to the terminal. To be sure, just tell the driver where you wanna alight so he wouldn’t miss ur stop. your post was a very helpful one especially for first-timers like me. ^^ just a quick question though. you mentioned that you went there on a Saturday. Was it super crowded by the time you arrived? We’re also planning to go there on a weekend. Thanks. Isn’t the shuttle bus option a 2-way ticket always for 23,000 krw? Can you buy one-way ticket to Nami, then take the subway option going back to your hotel. If so, how much did you have to pay for the one-way ticket? Hey Jinkay thanks for your useful information :),. I wanna ask regarding the bus schedule, i’m confused about how to read it. Do you think my shcedule is right? Chanced upon this and found it very useful!!! :> But I have a question! 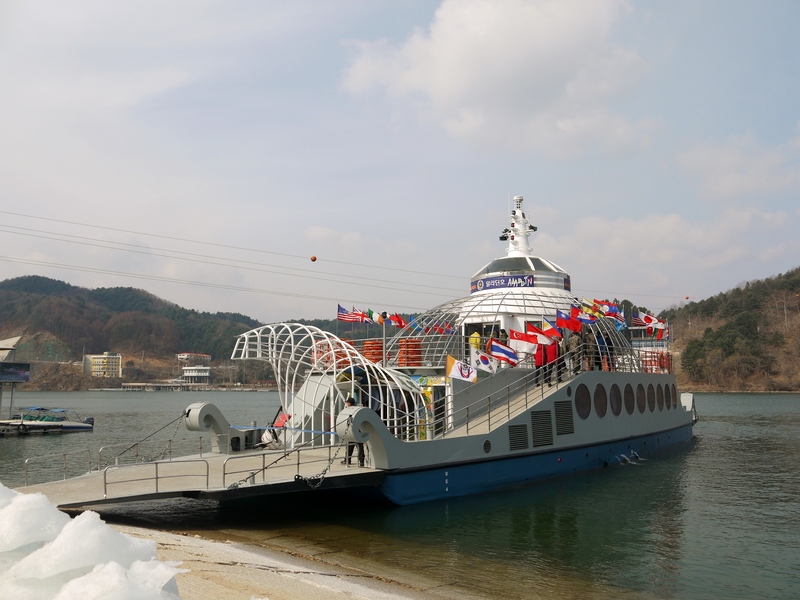 Do I have to take a ferry no matter what to get to nami island? For instance, if I choose to take the subway to cheongpyeong station and take the gapyeong tourist shuttle which stops me at nami island, do I still have to buy a ferry ticket to reach nami island? Hi Jinkay, we’re travelling in a grp of 4, and will be arriving at gapyeong station by train. From there on do you think it will be plausible if we just take cab for the following parts? Yes it is also possible to take a cab to your destinations. I’m not particularly sure how much each cab ride will cost, but there will be available taxis in gapyeong station and also in the wharf. As for petite france, you might find it difficult to get a cab, altho it’s not impossible, it’s just that cabs there are not as many as the crowded areas such as the wharf and subway station. You can opt to just take the bus from petite france back to cheonpyeong station if you can’t find a cab from there. Hope this helps. 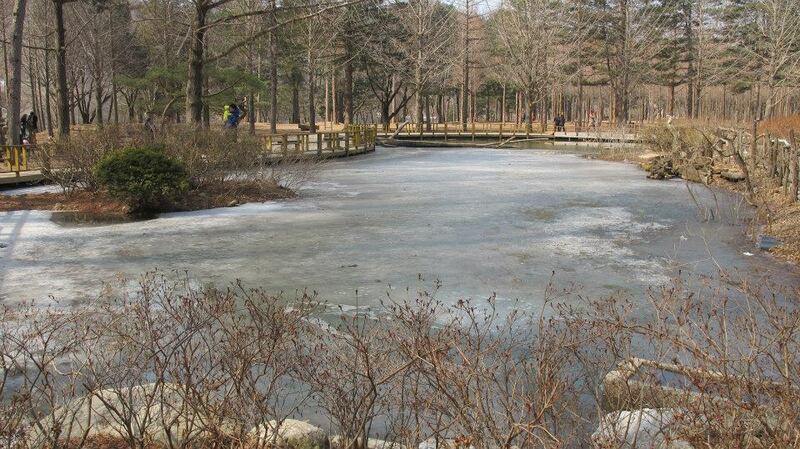 Thanks, we’ll see how it pans out when there =) One more question, what are the recommended food options at Nami Island? Sorry for my delayed reply. 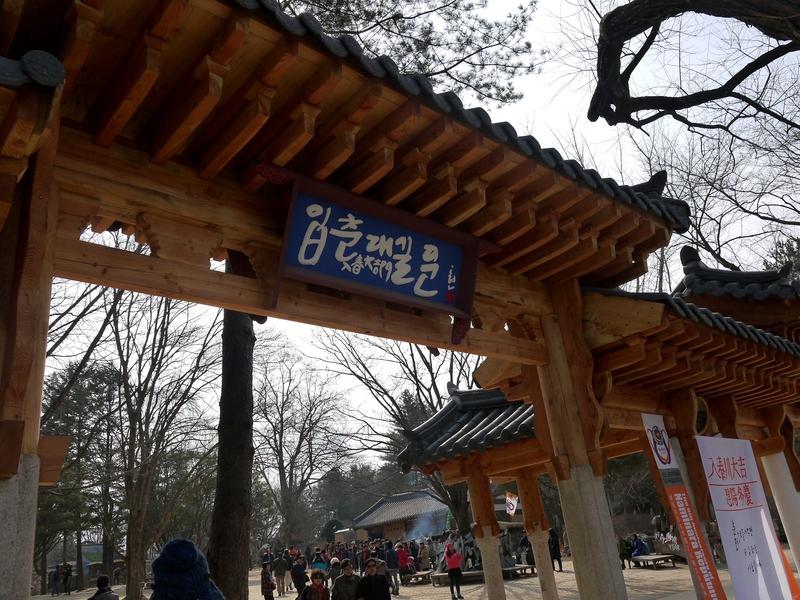 There are a few food choices inside Nami Island. I remember there was this hotpot/bbq restaurant in the center but you have to have a reservation if I’m not mistaken. There’s also a pizza place nearby, and a Chinese restaurant. There are also food stalls for sausages and corns. Can we take the bus back to Cheongyeong Station to travel back to Seoul? First time to go this weekend. 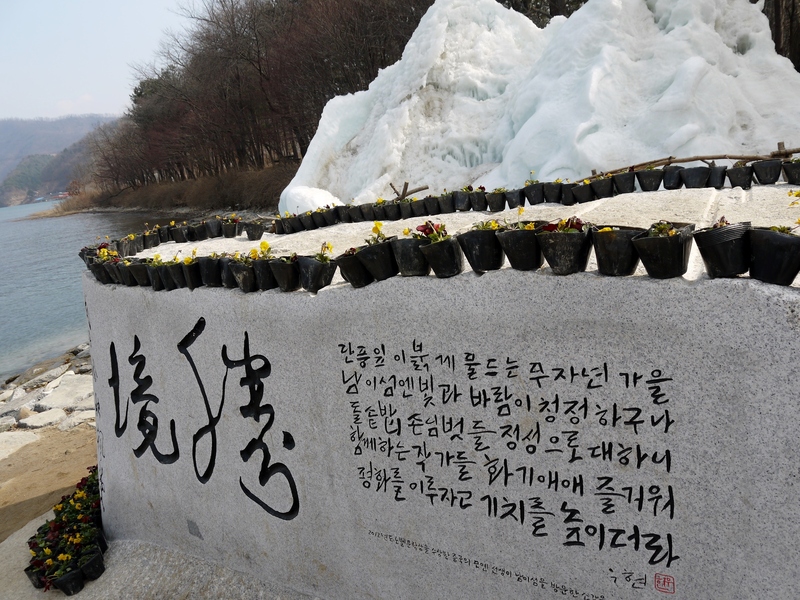 Was thinking of taking a tour to Nami Island and Petite France, do you think its worth it or a DIY tour will suffice? Thanks! Hmm.. If you wanna save on the fee you need to pay for the tour then I suggest you just do the DIY. Anything you need to know about both place you can find online anyways. Hi Jinkay! Just want to ask if Petite France is open either Friday or Saturday? According to KTO, they’re open from Sunday to Thursday. We’re planning to visit the place this month. Thanks! You can try this link. Thanks for visiting my blog. Yes the 23,000 won would include round trip bus ride to insadong. However, the bus would leave Gapyeong at 4pm. You can go to nami-petit-garden if you want to. But if u want to catch the bus back to insadong, you wouldn’t have enough time. The bus for nami-petit-garden is separately paid (5,000 won to be paid to the bus driver). Hope this helps. Hi Jinkay, thanks for your very informative blog. I am planning to do the same route you made for our Nami-Petite France tour May 29, but I am travelling with my family and I have a teenager, 12 years old boy and 7years old boy. Is there a shuttle that can take us back to Insadong or Myeungdong? I looked up the Metro journey back and Im afraid the kids would be very tired after a whole day tour or Nami and Petit France. Thank you. The only shuttle bus back to Seoul that I can find online is the same shuttle bus you will take going to Nami. So if you plan to go to Petite France, I suggest to just go half day to Nami and half day to Petite France. The shuttle bus we took before leaves at 4 pm. There is one site I saw that have roundtrip shuttle bus which leaves Nami at 6pm so maybe you can take that instead (http://packagekorea.com/tour/nami-island-shuttle-bus/). Another option would be to hire a taxi which I’m guessing could be a bit expensive. Hope that helps. Thanks for visiting my blog. From Gapyeong change in Mangu stn and take the J line to Yongsan. Then alight in Hoegi and take Line 1 to Incheon and alight at Jongno (3). You can also download the Explore Seoul app so you check all the subways in Seoul. Hope this helps. helooo 🙂 i confused you said the hop on bus is 5000won, that’s for oneway or how? 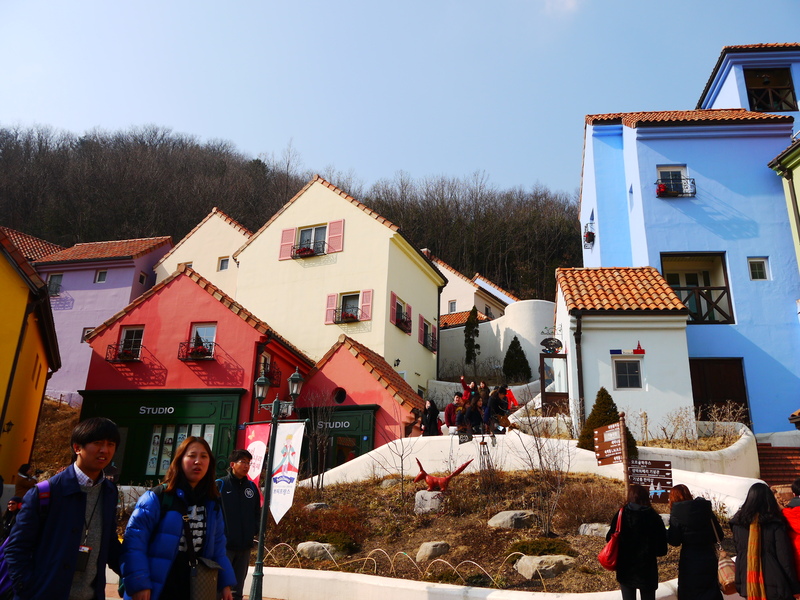 if we take it from gapyeong station to petite france and back so we pay it 100000? Hi. The 5000 won for the hop on bus is unlimited. The first time you board the bus you need to pay to the driver and he will give you a ticket. You can show that ticket to the driver every time you ride the bus. Hope this helps. Thanks for your informative blog. 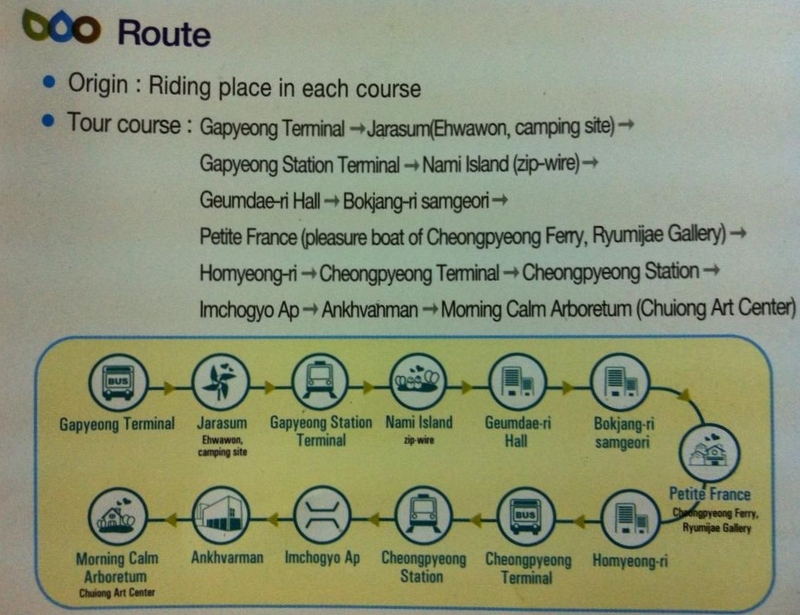 How long was the journey from Insadong to Gapyeong Wharf using the shuttle bus? Your blog is amazing and so are your pictures! It’s been extremely insightful. 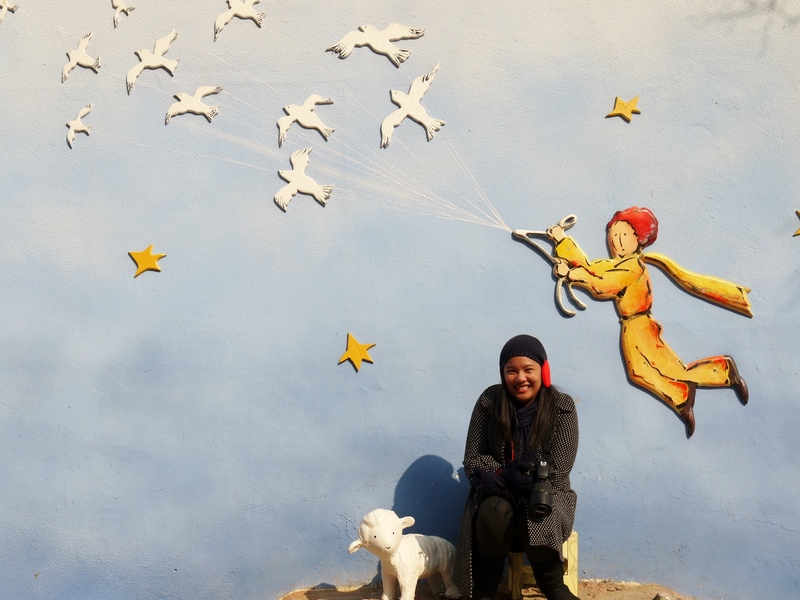 Thank you for writing such a detailed entry on getting to Nami Island + Petite France! Would you mind helping me with a few questions please? You mentioned taking the shuttle bus from Insadong, Jamsil station that departs at 9:30am. Would you mind explaining how to actually get to the shuttle bus boarding place please? 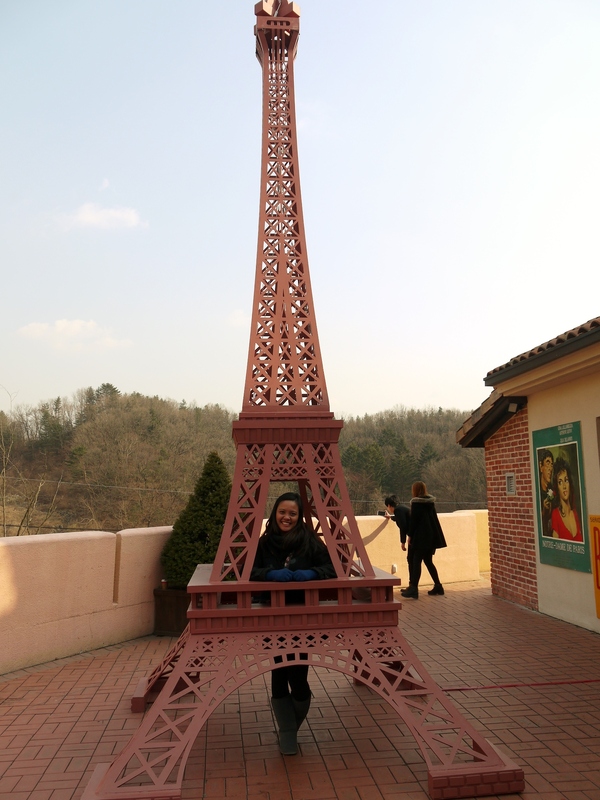 After Ziplining to Nami Island, I’l be heading over to Petite France. Would you be able to suggest an alternative route to getting there from Nami Island instead of taking a ferry back to the wharf? I’m wondering if the Gapyeong Tour Bus might have a stop at Nami Island where I could purchase tickets from and hop on to go to Petite France. Thank you so much for taking the time to read through my questions! to book for the shuttle bus online and make online payment. Hope this helps. Enjoy Korea! Would like to know how to get back to the wharf? Hi! Thanks for thr informative blog 🙂 Can we go back anytime to Gapyeong wharf from Nami Island or is there a schedule? hi, may i ask question? did outside nami island have taxi going back to gapyeong station? Yes there should have. you can ask the tourist information counters and they would help you out. My question : Can you give me information , how could i go to Petite France from ferry terminal? You can give me good suggestion. Thanks you. 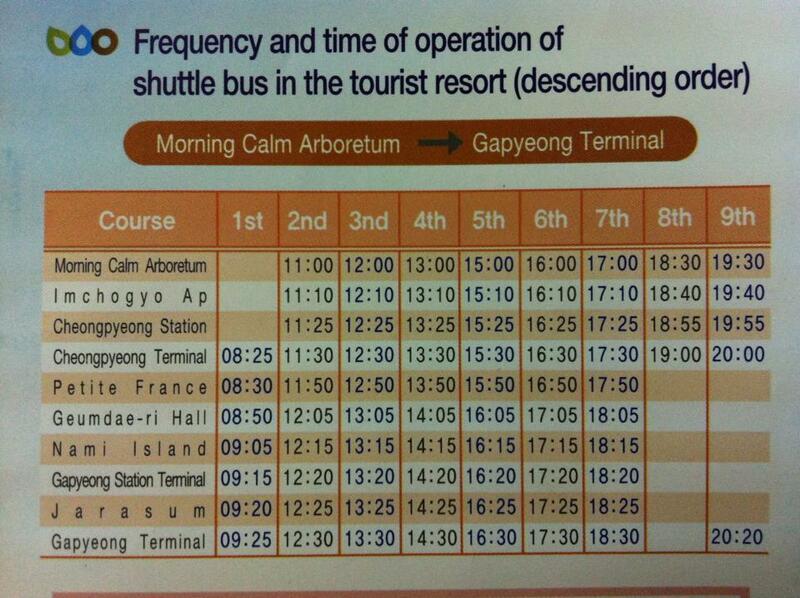 you can take the tourist bus from the gapyeong ferry terminal. just walk up to the 711 store nearby and hop on the tourist bus opposite the 711 to Petit France. Kindly check my blog for more details. Thanks! hi Jinkay! thank you for this informative blog., just want to clarify, going back to seoul via subway/mrt from petite France, shall we alight gapyeong terminal or gapyeong station terminal? I am just a bit confuse. thank you! Alight at the Gapyeong station terminal. You need not worry since the bus will stop first at the Gapyeong Station Terminal, and you can clearly see the train station there. Also, majority of the passengers will alight at this stop. Thanks! hi Jinkay, thank you for your blog. just to clarify, the mrt you are taking back to insadong is ltx? from that mrt what’s the closest station we can alight to reach insadong? Thanks for the info, I’ve been looking for this! But, you mentioned that we need to purchase the bus ticket beforehand, where exactly in Insadong the main office located? Thank you! Its along insadong just before you reach tagpol park.